Locals and tourists passing through London's St Pancras International train station got the surprise of a lifetime yesterday. 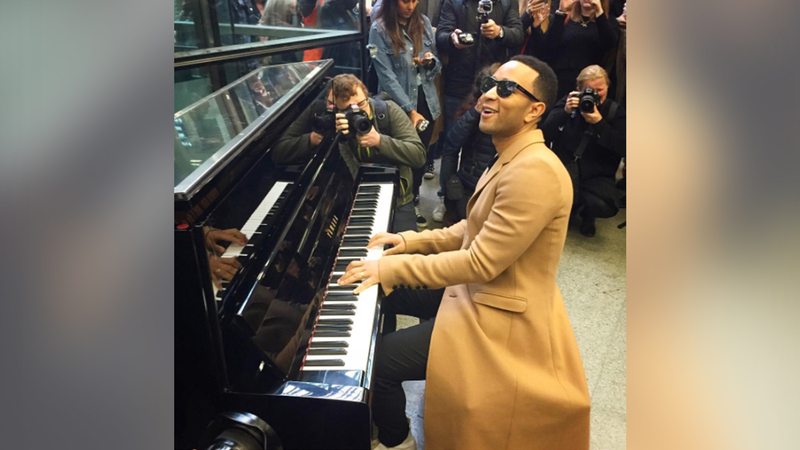 Singer-songwriter, John Legend flew into town to do press for his latest album, Darkness and Light, and decided to hold an impromptu gig at the famous landmark. It wasn’t just any random performance, either—this special event was Legend’s way of properly celebrating International Piano Day with fans and lucky bystanders. Prior to the performance, the esteemed producer gave his fans a heads up on Twitter, asking if there was still a piano there in the center of the bustling station. It proved to be no random inquiry, as the Grammy-winning performer arrived on the scene to surprise crowds with three song mini-concert. Fans captured the special set on social media as Legend fired off "Ordinary People" and "All of Me”, as well as “Surefire” from his latest LP. Check out some videos the awesome show below, and don’t forget to track John Legend on Bandsintown so you don't miss out on his upcoming tour!